A career coach's tools and notes for helping you like Mondays again. I'd like to present the first in a series of question and answer sessions with people I see who are happy with their work. I'm starting with a friend of mine, Pam Ehrenberg, who is the author of two novels for young readers: Tillmon County Fire and Ethan, Suspended. She also has two other novels in the works. She's been an inspiration to me and many people I know. In addition to her writing, Pamela Ehrenberg is a consultant for the National Council for Accreditation of Teacher Education and for Getting College Right, as well as a workshop leader (in-person and online) through the Writer's Center of Bethesda, Maryland. She visits schools, libraries, writer's groups, and others in person and via Skype. What has been your best career decision to date? To take my fiction-writing seriously enough that I might someday be able to mention "writing" in the same sentence as "career." I had always known that writing was where my heart was, but I had compartmentalized it into being just a hobby, so I spent a fair amount of time trying to find a different area I could love just as much but that would sound more "career-like," whatever that means. The best decision was reframing my thinking to make writing more central to my work-life and to life in general. The decision came after I spent a year teaching seventh- and eighth-grade English at a Washington, DC junior high school. I had no idea what an all-consuming venture it would be just to survive in the classroom, let alone what it would have taken to develop the kind of teaching career I could feel passionate about. After that year, I had an opportunity to work a "regular," 9-5:30 job at a nonprofit organization. I decided that if I took the job, I was going to make sure that the "extra" hours in my day, and the extra brainpower that came from no longer being an exhausted teacher of 13-year-olds, fed directly into writing: finishing projects that I started and really giving a fair chance to see where I could take this novel-writing thing. So I wrote at lunchtime, in the evenings, on weekends; for a while I came into the office early so I could spread out at a conference table and revise my novel. 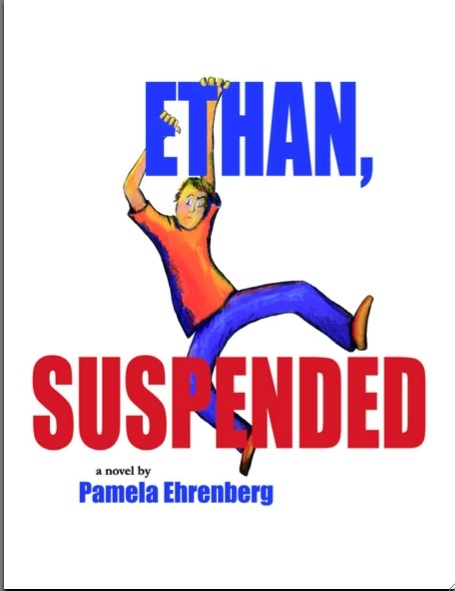 I started the first draft of Ethan, Suspended a few weeks after I started that job; five years later, I had a book contract. Also a new baby--but that was another set of career decisions. What things do you do that contribute to being happy in your work? Seek out connections. In general, I'm pretty well-suited to working independently--but now that I don't have the "default" social scene of being in an office every day, I find that I treasure more the connections I have with other writers, librarians, teachers, and "book people"--as well as people who are kind of independent spirits in other fields. What are some things you see others do that contribute to their career happiness? Now and then I run across someone and think, "Wow, that person is 100% in absolutely the right job for them. One example is the head of the Breastfeeding Center for Greater Washington; another is my daughter's most recent preschool teacher. And my friend Annie, the interior designer; and Mike the museum curator might come close. Oh, and my friend Chad, who left his job on Wall Street for divinity school. These are people who, when you listen to them talk about their jobs, you forget that what they're talking about is their *job. * That's huge: imagine if your spouse/partner/mother/whomever came home from work and spoke with such passion that you forgot they were talking about work. What do I see these people doing? Finding--or creating--the right job and pouring their heart into it. I think heart is a big thing, and it's much easier to pour your heart in if you're in the perfect job for you. If your job situation is less than perfect, as most people's are even in happier economic times, I think you can still pour your heart into some aspect of it, even if that aspect is only a few hours out of your work week--and/or put your heart into figuring out a pathway from where you are now to the job you were born to have. Yeah, it's the "heart" thing again. Thanks so much, Meredith! I'm honored to be part of your wonderful blog and look forward to sharing it with others...you have always given such wonderful advice at so many transition points for me. Thanks so much for sharing the wealth through your blog! My pleasure, Pam! Thanks for contributing. As a career counselor I help workers navigate their careers during stressful times. I have worked at Georgetown University as a career counselor, helping students and alumni make satisfying career decisions, create better luck for themselves in the job search, and survive waiting by the phone for interviews.